﻿ AS Roma 0-2 Real Madrid. And Ronaldo makes the difference... again! 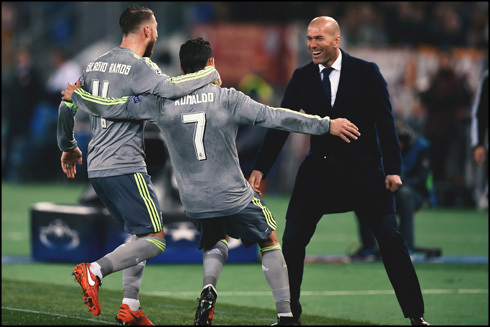 17.02.2016 » AS Roma 0-2 Real Madrid. And Ronaldo makes the difference... again! Zidane earned his first win as a manager in Europe, after leading Real Madrid into a 2-0 win in a away trip to Italy to face AS Roma this Wednesday night. The man of the match was once again Cristiano Ronaldo, who broke the deadlock and the resistence in Rome already inside the second half, when he scored one of the best goals of the competition in this season. Roughly 30 minutes later, Jesé would seal the win with another impressive goal, setting the final score in a very comfortable 2-0 lead to the Merengues. Real Madrid will now meet AS Roma again in Spain in 3 weeks from now, but only a true calamity could send Zidane's men out of the course of the UEFA Champions League's quarter-finals stage. It was far from easy, but Madrid survived their first real test under the tutelage of Zinedine Zidane, with an impressive 2-0 victory in Rome, despite a spirited performance from the home side. With Marcelo back in the side, still nursing a shoulder surgery, Madrid put out the strongest possible side hoping to grab some away goals and settle the tie. But early on, Madrid knew it wouldn't be an easy match as Roma brilliantly pressed, putting Madrid under pressure whenever they broke free. 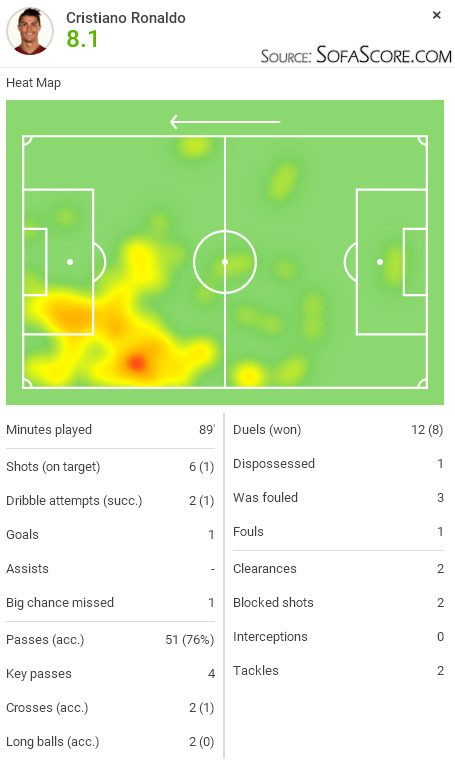 The Egyptian Mohammed Salah was brilliant constantly pressuring the defense and making things difficult particularly for Dani Carvajal. It wouldn't be until the second half when the fireworks would really start and it was the man of the hour, Cristiano Ronaldo, of course, who would make the headlines once again. Yesterday, Ronaldo stormed off the press conference after being badged about his away goalscoring record in recent months. Today, he stormed through the Roma defense, scoring a fantastic strike very similar to his goal against Bilbao this past weekend. It was the typical Ronaldo goal, cutting in from the wing and picking out the top corner with ease. And the fact that it's now happened two matches in a row may give the proponents of his supposed "decline" something to chew on. 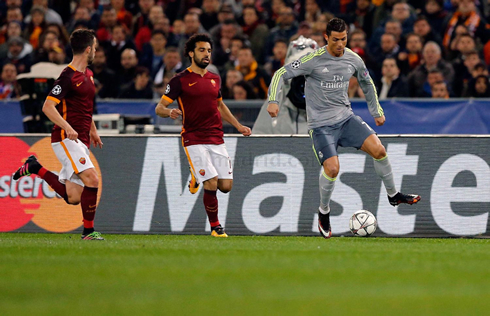 Madrid tried to dominate, but Roma and Salah were a constant presence. Navas had to be quick off his line a number of times and both Varane and Ramos had great games at the back. The Merengues would cap it off late in the game, with a brilliant goal from substitute Jesé. Picking up the ball on the wing he feinted once, then again keeping the defenders on their toes before blasting a strike into the corner of the net. A fantastic goal for the youngster and an important one as he continues to regain the confidence which saw him become such an integral member of the squad back in 2013. All in all, a great result and one that makes the second leg a much easier affair. 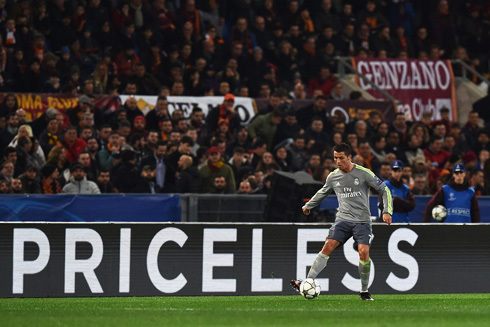 Zidane will be happy with the performances of his troops in Rome and Ronaldo has again answered the critics the best way he knows how: on the pitch! Cristiano Ronaldo next game will be for Real Madrid for La Liga, on the 21st of February of 2016, against Malaga. You can watch Juventus live stream, Malaga vs Real Madrid, Augsburg vs Liverpool, Midtjylland vs Manchester United, Fiorentina vs Tottenham, and Borussia Dortmund vs FC Porto, all matches provided from our live soccer and football game pages.